The Call to Actions add-on will provide functionality to inject a unique template within an Ajax Load More query. Easily include a custom advertisement block or call to action within each Ajax Load More loop. The Call to Actions add-on works by providing an intuitive and user-friendly method for website admins to inject advertisements or call to actions directly into the results of each Ajax Load More query. 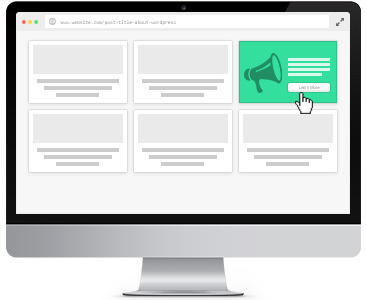 It’s as simple as choosing a display position within the loop and then selecting the Repeater Template that holds the call to action content. Call to actions can be anything you want them to be… an advertisement, a featured article or even a sign-up form – it’s up to you to decide. Note: This add-on requires an additional Repeater Template add-on for displaying call to actions. Please refer to the Requirements section in the sidebar for more info. The process for injecting call to actions into Ajax Load More results can essentially be split into two separate tasks. This task will involve the creation of a custom template that will hold the content or HTML container of your call to action. With the Shortcode Builder, it’s as easy as selecting your call to action template and then choosing the injection point within the Ajax Load More loop. Displaying a featured Ajax Load More add-on based on the current $alm_item value. Displaying advertisements from Google Adsense with Ajax Load More. Using the almComplete callback function to inject a random quote call to action into Ajax Load More results. Inserting a call to action into Ajax Load More results will require a unique Repeater Template. This template holds the content of your CTA and will be injected into each loop at the position specified in the shortcode. Note: You should always open and close a call to action template with an HTML element. The following template is used in the Featured Content example and will display a featured add-on based on the current $alm_item value. The following shortcode parameters are available with the Call to Actions add-on. cta_position is a colon separated value where the first value is before/after and the second value is the post position (in the current loop) where the call to action will be inserted. The following screenshot illustrates the process of building a Call to Action shortcode using the Ajax Load More Shortcode Builder. Below are common questions regarding the Call to Actions add-on. If you have a question and don’t see an answer here, please visit the support page and submit your request. Yes, the almComplete callback function is available for all call to action templates. Can I stop the call to action after a certain number of queries? Not yet, but this is something we are currently working on. For now, CTAs will be injected into the results of every query. Upon purchase of this add-on you will receive a confirmation/purchase receipt email. Your receipt will contain a direct link for downloading your copy of Ajax Load More: Call to Actions and a license key. Generate revenue with your Ajax loaded content by injecting advertisement blocks as users load additional pages. Easily call out important content to your users. 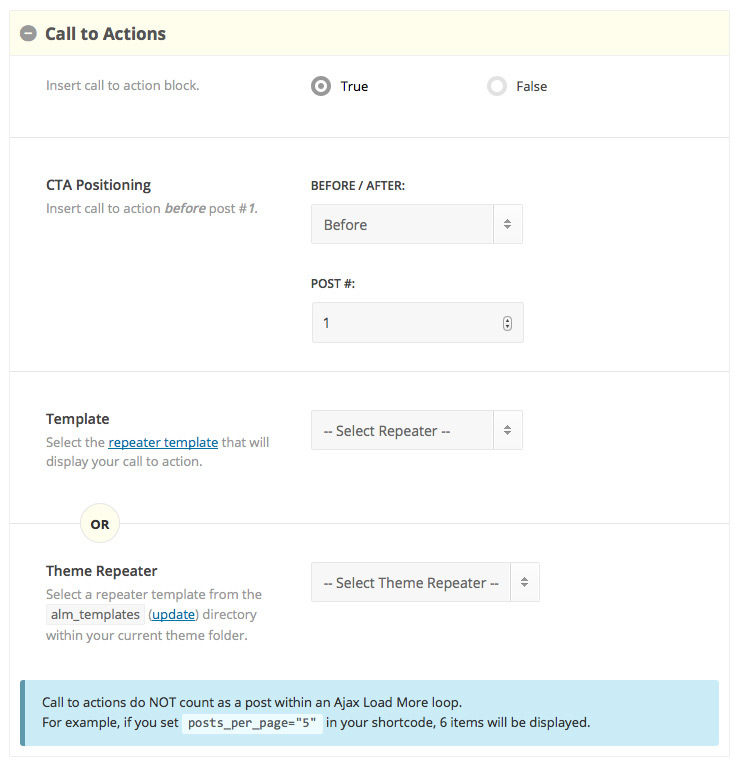 The Call to Actions add-on will require a unique Repeater Template for displaying content. The following Ajax Load More add-ons and extensions are currently NOT compatible with the Call to Actions add-on – We are working on these integrations and they will be released as completed. FIX - Fixed issue where CTAs were out of position causing issues with SEO add-on. FIX - Fixed issue with Paging add-on and CTA positions. UPDATE - Removing `EDD_SL_Plugin_Updater` class include as it was causing performance issues when viewing the plugins dashboard.